It is easy to get caught up in the brilliant, technical sheen of a Pixar film. The reflections of light on copper pots in Gusteau’s kitchen, the way Sully’s hair moves in a breeze, or even something as simple as a garbage bag stretching to the breaking point by Rex’s tail – all are dazzling feats of technology that get a lot of attention with each new release. 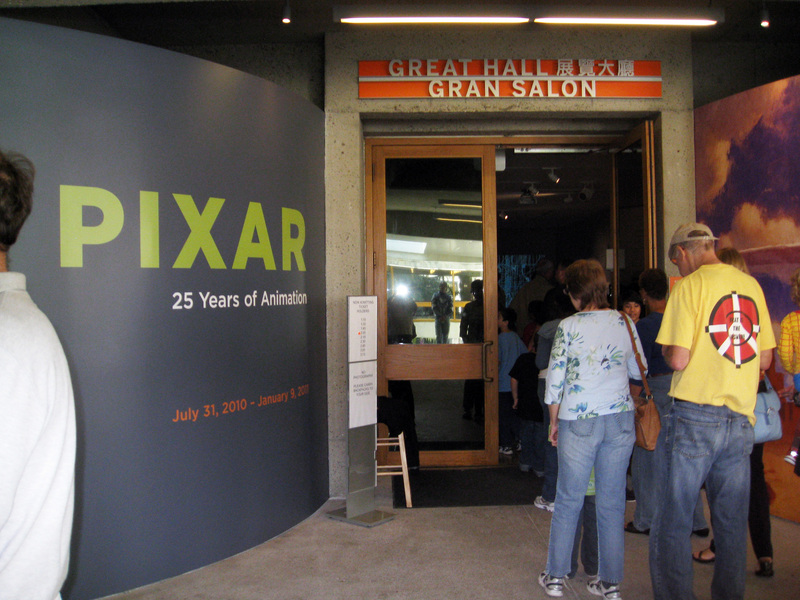 In many ways, the “PIXAR – 25 Years of Animation” exhibit that just opened at The Oakland Museum of California puts all that aside. This refreshingly lo-fi exhibit is truly a celebration of the human touch that goes into each Pixar film (feature and short). If you’re a Pixar fan like myself, then you’ve probably seen many of these pieces before in books or DVD bonus features. But seeing the work “in person” is a completely different experience all together. To get in close and really examine the subtle textures and cross-hatchings of actual ink (or charcoal, or pastels, or pencil) on paper is surprisingly fascinating and provides a completely different perspective. It is suddenly evident how the slightest pencil stroke in a thumbnail could inspire what would eventually be the final design of these now-iconic characters. This is where a lot of the magic happens. Lovingly presented in pristine white frames and mattes, you suddenly have a sense of relative size that you just can’t get from the ‘Making of…’ books released with each film. I was quite surprised by how small a lot of the studies were and vice versa. And there’s plenty to see and drool over. The exhibit is roughly divided into sections according to film and subject (story, character, world) and packed with goodies. Storyboards, colorscripts, maquettes, sketches and conceptual pieces overflow this recently renovated space. The famous Pixar Zoetrope is also on display here. But for me, the crown jewel of the exhibit is the Artscape – a wide screen, digital presentation originally created for the Museum of Modern Art exhibit in New York – updated here to include work from Ratatouille, Wall-E, Up, and Toy Story 3. Pixar Artist and Director Andew Jimenez has created a breathtaking, animated display of concept art from all of Pixar’s releases. Set to only sound effects, the film takes several conceptual pieces – many of which are shown in the exhibit – and slices them up. The resulting animation is similar to the old multi-plane camera examples. The viewer is able to move through these pastels and paintings as if it were a 3D environment. The 15-minute presentation is a gorgeous showcase and gives the entire exhibit an emotional core. I’m not sure what the future holds for this exhibit after it closes in January 2011 but it would be a shame if it didn’t continue to tour the country. 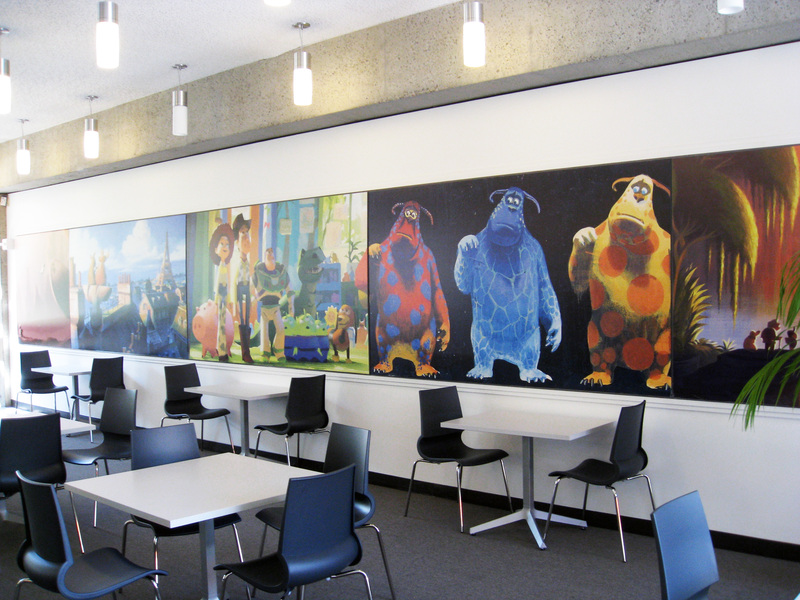 Better yet, “PIXAR: 25 Years of Animation” deserves a permanent home somewhere. To visit this collection every year, to see it updated with each new film, would be a great tradition. Photography in the exhibit is prohibited. The companion book to the exhibit is surprisingly comprehensive, including several photographs and reproductions from the exhibit. The hefty 208 page publication is available for purchase exclusively at the museum and on its official website and is well worth the $30. Prints featuring work from the show will be available in late August. 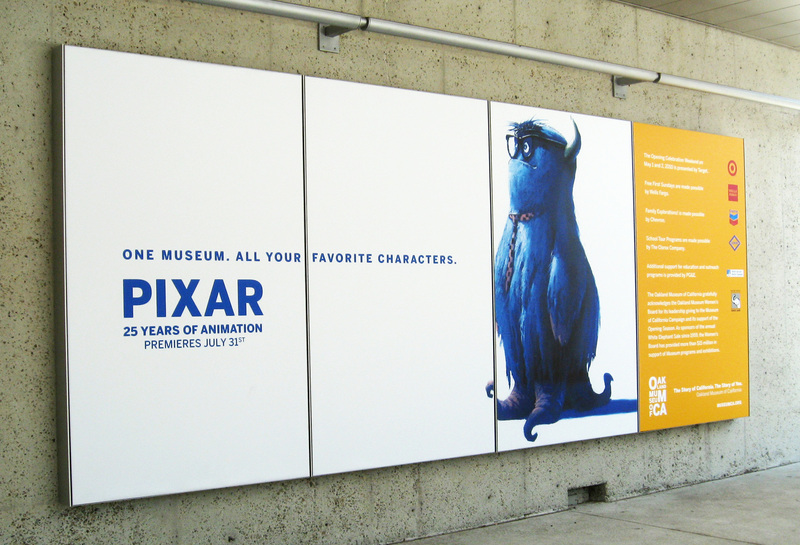 “PIXAR: 25 Years of Animation” is open for viewing at the Oakland Museum of California now through January 9, 2011. To purchase tickets to the exhibit or its companion book, you can visit the Oakland Museum of California’s official website. Jerrod Maruyama is an illustrator located in Sacramento, California. His great artwork can be seen over at his popular Flickr page. 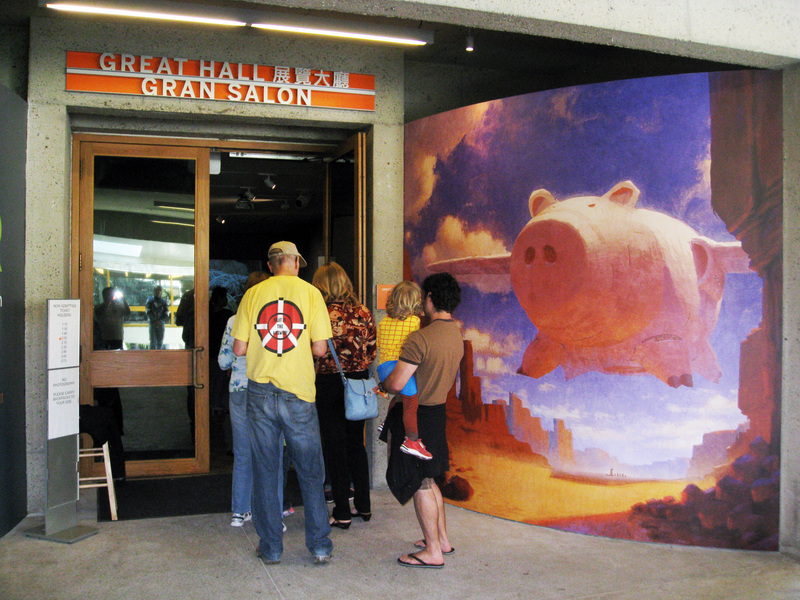 One of his pieces was even sold on T-shirts at the exclusive Pixar Studio Store. Special thanks to Maruyama for writing this review for The Pixar Times.